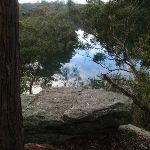 This walk, also know as the Black Cockatoo track, starts from Mowbray Park and explores the area where the Camaraigal Clan of the Guringai Tribe once lived. 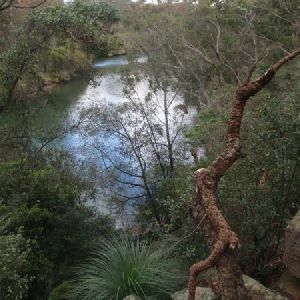 The walk leads across the top of a small escarpment and winds down and back along the Lane Cove river bank. The change in vegetation is quite defined and interesting. A boardwalk section through the mangroves gives a close view of river life that changes with the tides. From the intersection, this walk heads up the stairs, keeping the oval on the left of the walk as it winds around the hill. The walk leads to a park bench and intersection, above the spectators’ stand. Continue straight: From the intersection, this walk leads across the grassed area to a ‘Mowbray Park’ sign before a bridge. The track passes the sign and bridge to continue to wind through the bush for approximately 60m, to a signposted intersection. Continue straight: From the intersection, this walk heads up the hill away from the athletics oval, keeping the valley of the river on the left. The track winds through the bush, passing by a track (which leads to a rockshelf lookout on the left) and continuing on to a signposted intersection. Continue straight: From the intersection, this walk follows the ‘Upper Track’ arrow along the hillside. The walk goes down some stairs before skirting underneath a rocky outcrop (on the right) and continuing along a boardwalk. The track then climbs up to Avro Rd. Continue straight: From the road, this walk follows the signpost for the ‘Upper Track’ away from the road and down to a rock shelf. After only 30 metres, the track tends left under power lines, and turns right down some stairs beside a rocky outcrop. From the stairs, the track winds down the hill to the rocky surface at the 3-way intersection. Veer left: From the intersection, this walk heads west along the Lane Cove River bank, with the water to the right of the track. The track quickly opens out onto a clearing next to the river bank. The walk continues over two sections of boardwalked track, leading to a signposted intersection. Turn right: From the signposted intersection, this walk heads towards the large rock next to the water (below on the right). The walk uses pins bolted into the rock as handholds, and climbs to the other side of the river bank. The track then continues along the gap between the mangroves and a rocky outcrop, to come to the Mowbray Park athletics field. Turn sharp left: From the oval’s far corner, closest to the river and furthest from the road, this walk heads up the steps to the signposted intersection. Turn right: From the intersection, this walk heads along the hillside towards the oval (below on the right). The track winds through the bush for approximately 60m to pass over a bridge and a ‘Mowbray Park’ sign in a grassed area. The walk crosses this grass area to come to the intersection with the footpath. Turn left: From the intersection, this walk heads up the footpath away from the oval, climbing the steps to the bus stop next to Mowbray Rd. Continue straight: From the park bench, this walk heads down the footpath, keeping the oval below on the right. The walk continues down the hill for a short time to soon come to the intersection to the side of the oval. 780m of this walk has short steep hills and another 500m has gentle hills with occasional steps. The remaining (260m) is flat with no steps. 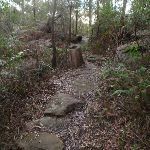 1.1km of this walk follows a formed track, with some branches and other obstacles and another 240m follows a clear and well formed track or trail. The remaining (240m) follows a smooth and hardened path. This whole walk, 1.5km has directional signs at most intersection. 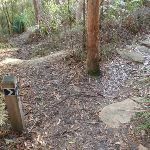 Around 1.4km of this walk requires no previous bushwalking experience, whilst the remaining 140m requires some bushwalking experience. Around 1.4km of this walk is not usually affected by severe weather events (that would unexpectedly impact safety and navigation), whilst the remaining 140m is affected by storms that may impact your navigation and safety. Around 830m of this walk has limited facilities (such as not all cliffs fenced), whilst the remaining 710m is close to useful facilities (such as fenced cliffs and seats). A list of walks that share part of the track with the Garadi Track walk. 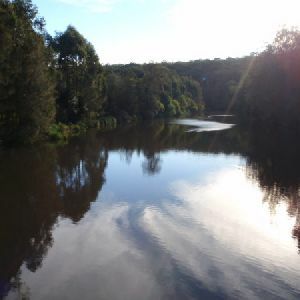 This walk loops around a section of the Lane Cove River. 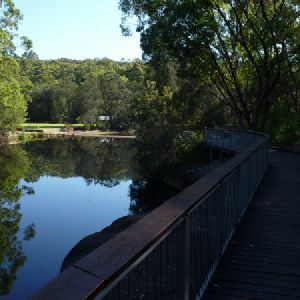 Starting at Fullers Bridge, the walk follows the Great North walk through the historic site of Fairylands to Epping road before crossing the Lane Cove river and heading up the other bank of the river, passing through a variety of environments including a Golf Course. The walk then returns to Fullers Bridge. This walk leads down through the valleys beneath the houses, high on the ridge tops, to reaching the banks of the Lane Cove River at the Chatswood Golf Course. The walk then follows the scenic river, using boardwalks at times. The walk sees another side of Chatswood, with many natural treasures hidden along the way. 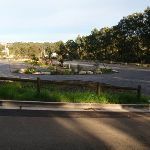 This walk begins in the busy city of Chatswood and soon enters the nearby bushland around the Lane Cove River. The walk uses the v-shaped valleys to escape from the houses. 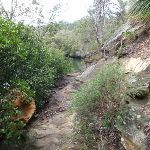 Due to pollution and rubbish in stormwater run-off there are some less then pleasant pockets, however, this walk does explore some wonderful views of the Lane Cove River and its surrounds. You can buy lunch at the Golf course, or there are plenty of nice spots along the river to stop and eat. A list of walks that start near the Garadi Track walk. 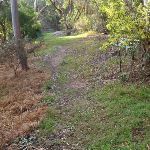 This short walks follows a section the Great North Walk along the Lane Cove River to an old picnic ground know as Fairylands Pleasure Grounds or “the Rest”. 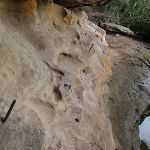 The walk gives great views of the river and of some sandstone formations. Fairylands has mostly grown over now, but still has some bits of history to explore, or you can just relax and watch the river go by as you eat lunch. 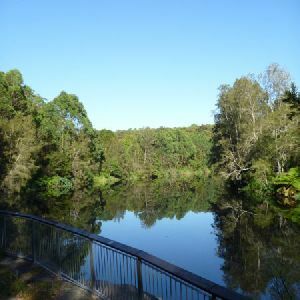 Starting at North Ryde train station this walk explores a stretch of the Lane Cove River, visiting the historic Fairlylands Pleasure Grounds along the way. The walk starts by wandering through the Riverside Corporate Park and soon comes alongside the Lane Cove River to join the Great North Walk. Here we follows the GNW though Fairylands before exploring a few streets in Chatswood West. 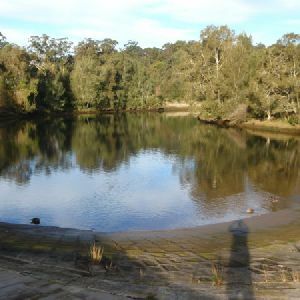 After the weir, this walk leaves the main spine of the Great North Walk to explore the lovely River Side Track, through many picnic areas and up to the Lane Cove Tourist Park. Here the you wander along the roads back to the train station. 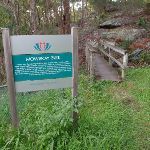 For the most part, this walk follows a section of the Great North Walk through “Fairylands” and past a few waterfalls, then across Lane Cove River (via Epping rd) to Mowbray Park. Starting and ending on two busy roads, it is a pleasant surprise to visitors how nice the bushland can be. 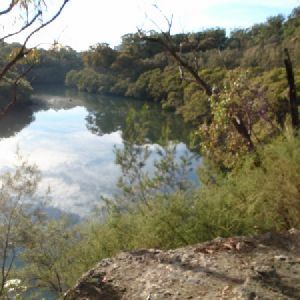 Allow some time to enjoy Fairylands and the views of Lane Cove river along the way. 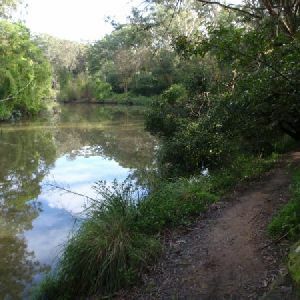 This walk follows a large section of Lane Cove River. The walk follows the Riverside Walking track up the Lane Cove River to De Burghs Bridge. From the bridge the track winds back along the hillside on the other side of the river. The track then passes a few historic buildings, and the Visitor Centre, before crossing at the weir and returning to the Tourist Park. There are plenty of grassy picnic areas along the way and the Boat Shed sells snacks. 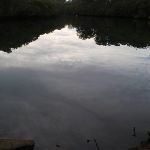 This walk, from the Lane Cove Tourist Park to the Lane Cove River Boat Shed, meanders along the placid Lane Cove River, passing many picnic areas along the way. The Boat Shed itself is surrounded by a large picnic area with plenty of space for the kids to run around and play. You can even hire a boat and go for a paddle. From the Tourist Park, this walk heads down to the other side of the Lane Cove River, to Baker’s Cottage. 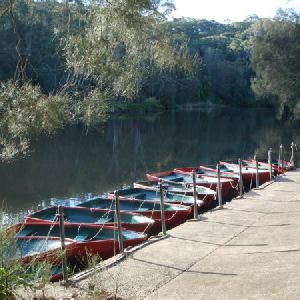 The walk passes the Lane Cove River Boat Shed and a play ground for the kids with plenty of open areas to run and play. Baker’s Cottage, perched up a slight hill, is worth the short distance with its unique history and age of the structure. Grab an ice-cream from the boat shed or hire a boat and go for a paddle. Spend some time and enjoy the park and bush lands. 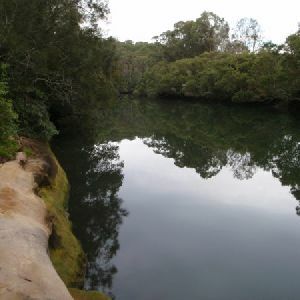 This walk explores some of the hills and river banks of the Lane Cove National Park. Leaving the weir precinct on Max Allen Drive, the walk follows the Great North Walk over the hill and down to Fiddens Wharf (just near the oval). The return journey, past Schwartz Homestead, provides a great chance to see some local heritage. The track passes several picnic areas by the river providing a great chance to rest, eat and enjoy the view. The Baker’s Cottage Heritage Track is a quick and interesting walk. The track itself is mainly drivable road, and turns to bush track before going up the hill to the cottage itself. 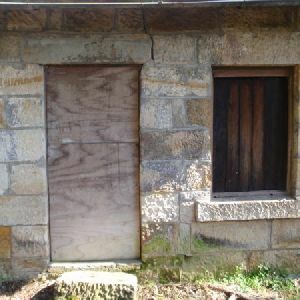 At 140 years of age, Baker’s Cottage is the oldest unmodified structure, still standing, in the Ku-ring-gai area. All entrances to the cottage are blocked, so you can’t see inside. It is worth looking around the ground to see some other historic remains. 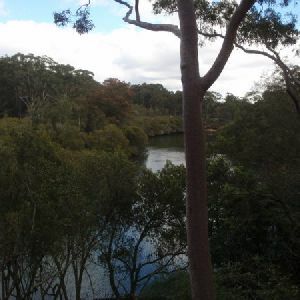 This is a great way to explore the picnic areas and banks of the Lane Cove River. There are picnic areas and plenty of seats to enjoy along the way. On the weekend you can hire a boat and go for a paddle before heading back to the start. You could spend a whole day enjoying the river, bus and parklands. The walk is mostly flat and the alternate route leads around the only really rough section of the track. 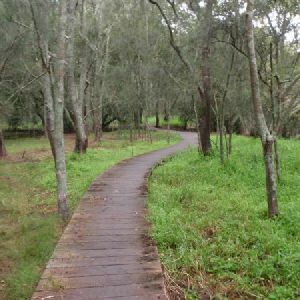 This walk is a lovely stroll along one side of the Lane Cove River. The walk passes through many picnic areas, providing plenty of options for rests and food breaks (some having BBQ’s). This walk is also good for taking a Frisbee or a ball along for the kids. 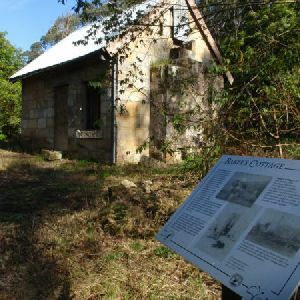 The Heritage Walk visits many of the historically significant buildings within the Lane Cove National Park. 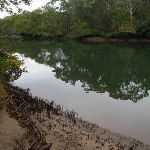 The walk follows the Lane Cove River from Fiddens Wharf and finishes at the Weir Precinct on Fullers Rd. The buildings are surprisingly intact, considering their age and history. A great walk for those wanting to see some culturally significant heritage buildings. This walk, from Chatswood to Epping, is a long but enjoyable walk along the Lane Cove valley. The walk mostly follows the Lane Cove River to Terry’s Creek, then follows Terry’s creek, under some major roads, to Epping. 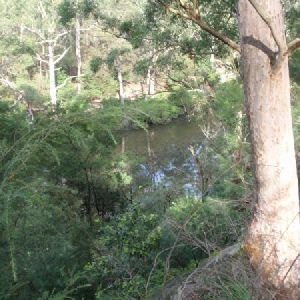 A great walk exploring bushland so close to the suburbs. 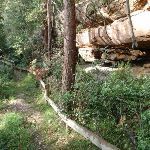 http://new.wildwalks.com/wildwalks_custom/includes/walk_fire_danger.php?walkid=nsw-lcnp-mpl Each park may have its own fire ban, this rating is only valid for today and is based on information from the RFS Please check the RFS Website for more information.